Hamilton city leaders still support the deal. 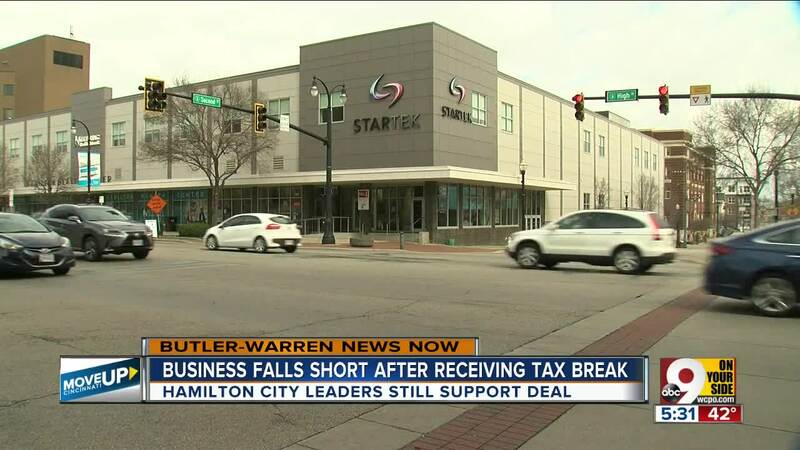 HAMILTON, Ohio — It was Hamilton’s biggest jobs win in a decade when the call center company StarTek Inc. won state tax credits in 2015 to bring 682 jobs to a dormant Elder Beerman store on High Street. Four years later, restaurant owner Les Rudisell is still waiting on the increased foot traffic expected from that deal. Rudisell said he gets 10 to 15 percent of his revenue from StarTek employees and the climate in downtown Hamilton is improving. But he can always use more customers to enhance what is now a break-even retail location. StarTek is one of 23 companies that failed to comply with the terms of their agreements for Ohio Job Creation Tax Credits in 2017, according to a December report by Ohio’s Attorney General. StarTek voluntarily terminated its agreement in 2018 without receiving any of the $1.3 million in tax benefits it was eligible to claim under its 2015 agreement. StarTek currently has about 200 employees in Hamilton, well short of its original goal. Tax credits are among the state’s most popular economic development tools, helping to finance 160 business-expansion projects in Butler, Clermont, Hamilton and Warren counties since 2008. In those 160 deals, companies promised to invest more than $2.2 billion to create 17,847 new jobs and retain 18,886 existing jobs. In exchange, state officials offered tax credits that would reduce their Ohio tax liability by up to $106.5 million. The Ohio attorney general’s office evaluates compliance with those agreements every year in a process that allows state officials to revise or cancel any deal that doesn’t produce the intended result. In its most recent report , published in December, Ohio's attorney general found 71 companies in compliance out of 94 deals that listed 2017 as their "closeout year," meaning the year by which job-creation goals had to be completed. Ohio had a compliance rate of 75.5 percent in 2017, the second best performance in the last eight years. StarTek was one of six local companies labeled non-compliant in the December report. Messer Construction Co. agreed to create 32 new jobs and retain 97. Although it created only 27 new jobs, its total payroll increased by $9.2 million, nearly four times the $2.35 million in new payroll it promised. SSB Manufacturing Company promised to create 106 jobs and retain 181 by expanding facilities in Monroe and Forest Park. It exceeded its job-creation goal with 122 new jobs, but generated 13 percent less than the $5.85 million in new payroll it promised. Global Cloud Ltd promised to create 20 new jobs and retain 30. It fell four jobs short of its job-creation goal but exceeded its $1.1 million new payroll goal by 30 percent. FirstGroup America Inc. fell 21 jobs short of its job-creation goal of 75 new positions while achieving less than half of its new-payroll goal of $3.9 million. A fifth deal for C.M. Paula Company in Mason was modified to reduce the number of years tax credits could be claimed from six to three. The privately-held parent company for greeting card, robotics and metal stamping subsidiaries agreed to create 29 jobs and retain 80. By the end of 2017, it created no jobs and reduced total employment to 73. The state report shows StarTek exceeded a job-creation goal of 682 new jobs. But many of those positions were seasonal in nature, so they didn’t last a full year. That caused StarTek to fall far short of its goal for $15.7 million in new payroll. In the end, state records show StarTek created 864 new jobs by the end of 2017 with a combined new payroll of $7 million. That works out to an average of $8,096 per employee. Because it’s a publicly traded company, StarTek is required to tell investors how its CEO pay compares to the median pay of all employees. StarTek’s median pay was $9,889 in 2017. Mario Baddour, vice president operations, StarTek Inc.
Baddour declined to reveal compensation details in Hamilton, except to say it’s probably “slightly higher” than the company-wide median because it’s close to Cincinnati – where wages are higher than in other StarTek markets. Baddour said StarTek offers “comprehensive benefits” and “very competitive wages” in Hamilton. He also said the company continues to regard the Hamilton office as a “flagship location” that can help it win “high value, high touch opportunities” for new contracts. The prospect for future growth makes economic development officials think the tax credit deal was worth doing in Hamilton. StarTek has an option to claim more space in the former department store that closed in 2009. The nonprofit CORE Fund bought the property in 2013 and invested $6.5 million in its redevelopment. Rudisell is encouraged by the surrounding development that’s taken root in Hamilton since 2015, including the $13 million Marcum Apartments that’s one block north of his story. Built in 2017, 80 percent of its 102 apartment units and four of its five retail spaces are leased. Hamilton city officials say 50 small businesses have opened in the city’s urban core since 2014 and 13 more are slated to open this year. Beyond that, city officials are expecting a huge impact from the Spooky Nook Sports complex at the former Champion Paper Mill. Five months after its groundbreaking, the $144 million indoor sports and convention center is expected to create 150 construction jobs and 365 part-time jobs after opening. Of the 100 full-time jobs expected at Spooky Nook, more than a third are expected to pay at least $56,000 annually.